It is our constitutional right to live in an environment that is clean and healthy, and is sustained for the enjoyment of future generations. The current methods of waste management violate this right, as those who are producing the waste we need to take initiative and contribute to a sustainable future. By motivating people to recycle we hope to take a step towards a more conscious and clean future. A cleaner and healthier city with more energy to support the growing grid. A more conscious and motivated community. More job opportunities and lower production costs. Lesser need for landfills and greater care for the environment. A more diverse ecosystem and management of invasive pests. Recycling produces less greenhouse gases than landfilling and incinerating. We decided to look at the current recycling facilities. In Figure 7 we have an example of the recycling bins placed around Johannesburg at present. The bins are round (which wastes space when stacked next to each other) and they do not motivate people to recycle. There are currently 27 major recycling collection points serving 1645 km². 1 for every 61 km². Lack of appropriate facilities contributes to a lack of recycling. More recycling collection points are needed –therefore this challenge needs to be dealt with by providing these facilities more locally. We need to motivate people to use these facilities. 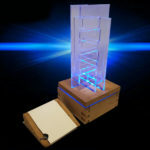 Because money can be made off of recycling then this money can be used for a good cause thus providing motivation through a trackable and tangible result of effort put in to recycle. The money made from the recycling efforts can pay for plates of food from Feed SA. These plates can be counted and used an indicator of efforts put into recycling. By finding means of communicating this indicator, the indicator can thus be used as a means of motivation for the individual. Hence the creation of a Perspex window in the recycling bins themselves. 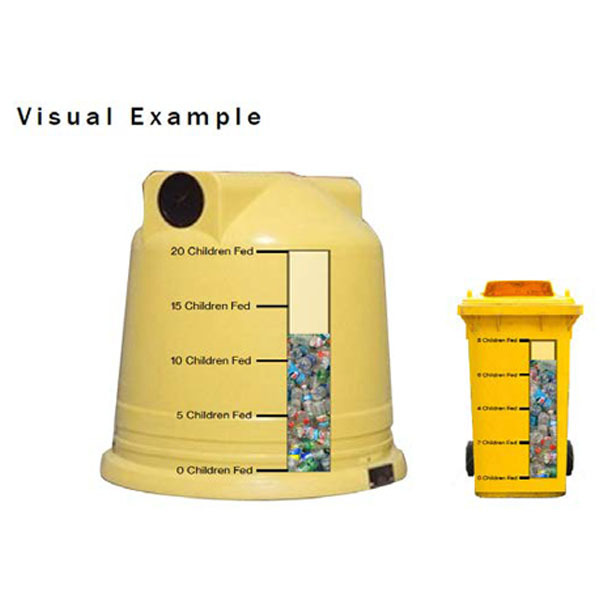 Acting like a bar graph this visual indicator communicates the ratio of recycled goods in the bin to that of the children fed through money made and donated to Feed SA. 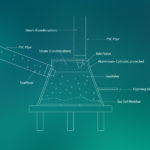 In order to achieve a bin with this design many factors needed to be considered: The size of the bin and shape of the bin; The size and location of the Perspex window; the manner in which trash was inserted into the recycling bin. 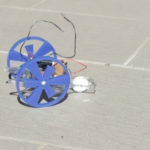 These factors resulted in a number of iterations. It was decided that the bin should be square so that they will be uniform when stacked next to each other and use a moderate amount of space. These bins use space more effectively than the current round bins. The hole which the rubbish is inserted into is 1,35 meters above the ground just above the average height of a door handle at 1 meter. The bins have “roofs” this is designed to act as a notice board providing information and updates. Due to the bins having to be large enough to service the needs of a single suburb, the notice board is relatively high up. 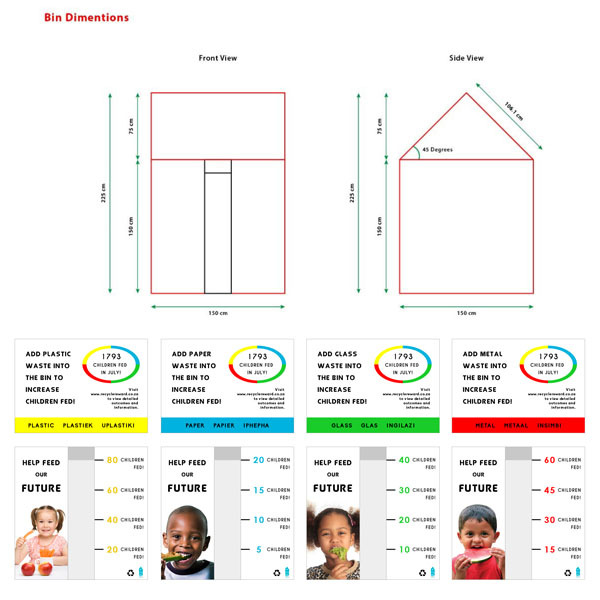 To adjust for this height has been added so as to achieve a 45 degree angle roof –thus insuring that the information and crucially the information on how many children have been helped thus far in the drive is legible. 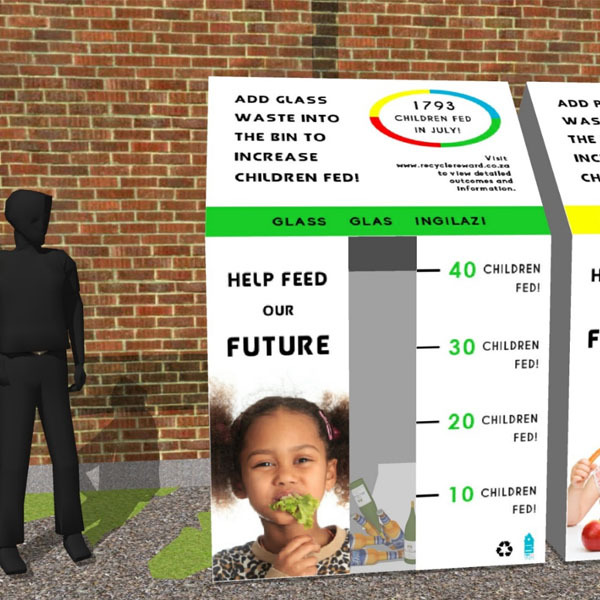 On each bin there is an image of a child consuming food –this aligns with the call to action suggesting that the user place glass into the bin in order to increase the number of children having been fed by the initiative. The slogan –Feed the future, has a double meaning here. Whilst you are feeding the children who are the future generations you are also helping to add to sustainable practises through recycling and as such supplementing the future of the planet Information on the initiative has been placed on the noticeboard so that if anyone wants to access more information they can. The identifying strip using colour and language to identify the recyclable that the relative bin is assigned. 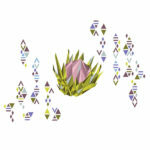 Glass is named in the 3 most prevalent languages in South Africa at present. The colour assigned to each recyclable is universal –thus if one of the three languages is not spoken by an individual then the colour can serve as an indicator of use. A sticker was chosen for application of the updated total. If this had been done by hand there could be possible legibility issues stemming from differentiation in handwriting. As this sticker is of paramount importance to the initiatives success this could not be left to chance, instead a sticker will simply be placed over the older one monthly. This also creates a uniform means of communicating thus it is easily recognizable to the user. GEM and Recycle Reward collaboration. Aside from collecting household recyclables, Recycle Reward would collaborate with GEM (Going the Extra Mile) another initiative which trades vouchers (airtime, food etc.) for time spent volunteering in social service. GEM and Recycle Reward would clean up any location strangled by rubbish. 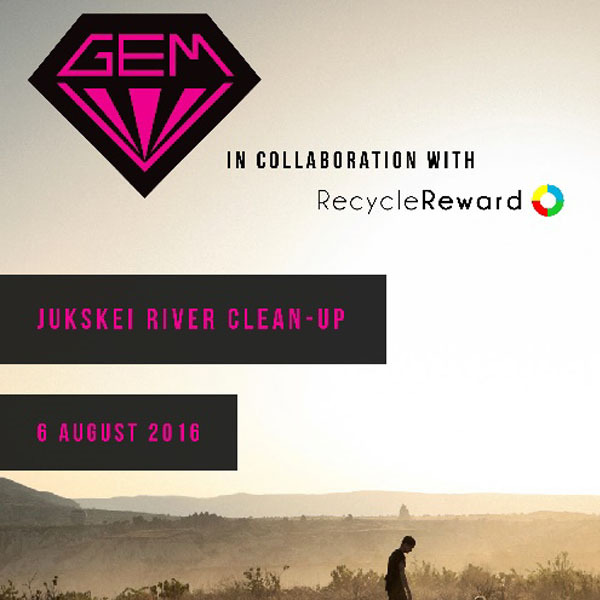 The posters example is that of the Jukskeiriver –GEM volunteers would come out and spend time to collecting trash and placing it into the Recycle Reward bins. Recycle Reward would then dispose of the recyclables. This is mutually beneficial as Recycle Reward gains trash which translates into charitable money and GEM doesn’t have to deal with the trash.